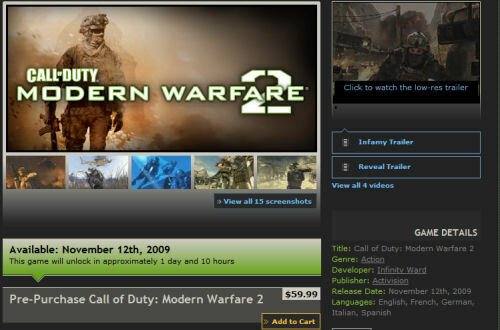 Despite releasing today to retail outlets and even requiring Valve's Steam service to play, Modern Warfare 2 will not be playable until Thurdsday at 12AM if you pre-ordered via Steam. We're not quite sure what's going on here, but after the whole Left 4 Dead 2 demo fiasco we're beginning to lose faith in consistent delivery of a timely product on steam. Luckily if you did pick up the PC version of Modern Warfare 2, despite your trepidation to certain decisions, the game is still playable. You may have to wait a little longer for some co-op action if your buddy decided to go the complete digital route. Page created in 0.2518 seconds.